A lot of people in my circle have begun to ask me about Twitter. It seems the media is a buzz about Twitter and people are wondering what it is all about, should they join, and am I on Twitter? Since I read the entire internet so you don't have to.® what follows is my view on what Twitter is and why it's becoming so popular. Twitter is a way to update your status or "micro blog" on a subject in 140 characters or less (basically the length of a SMS text message on a cell phone). Since 61 percent of the worlds population has a cell phone - the Twitter phenomena continues to explode through text messaging. Once you join Twitter and get a username (mine is PatrickKaine), you'll want to start following people. When you follow someone and they send a tweet (the really gay way of saying they updated their status), you'll be able to see the message on your Twitter home page, on your cell phone as an SMS, through an RSS subscription, or any/all of these. Keep up with things that are happening RIGHT NOW. I am following 69News (our local news station) and tonight they tweeted (I really hate writing that) about a severe thunderstorm approaching with hail and a funnel cloud. Lets say you are absolutely fascinated with Facebook and want to read everything about it. Do a Twitter search for Facebook and get real time results of people "talking" about it. Tip: I like going to Twitscoop and watching the rising trend key words to see what people are talking about right now. Stay 'indirectly' connected. Lets say that a group of co-workers are working on a project or are just working together. I wouldn't send an email to Amy telling her that I'm stopping in on a client - but I might chose to use Twitter to update my status about this and all of those who follow me will be a little more "connected" knowing what I'm up to. When you do the same, we're staying connected - maybe even from hundreds of miles away from each other. Connect with people who share similar interests. I recently contacted a co-worker through Twitter about how she was using her iPhone for work and if she was able to access SalesForce.com on it (the CRM program we use at my job). I end up getting an @reply from someone who saw my message and wanted to let me know that SalesForce now as a free lite version for the iPhone. Posting mobile photos. Take a photo from your mobile phone and upload it to Twitpic. The subject line of the MMS will be your status update on Twitter with a link to the photo you just uploaded. Who could forget the US Airways crash in the Hudson? This photo was uploaded to Twitpic and Twitter in real time. This guy was in another plane crash and was Twittering his updates from the inside of the jet! Here is some basic Twitter know how to help get you started. directs a twitter at another person, and causes your twitter to save in their "replies" tab. Example: @patrickkaine I love your blog! sends a person a private message that goes to their device, and saves in their web archive. Example: d patrickkaine want to pick me up some milk while you are at the there? retrieves the profile information for any public user on Twitter. retrieves the latest Twitter update posted by the person. reminds a friend to update by asking what they're doing on your behalf. this command returns your number of followers, how many people you're following, and which words you're tracking. will send an SMS invite to a friend's mobile phone. 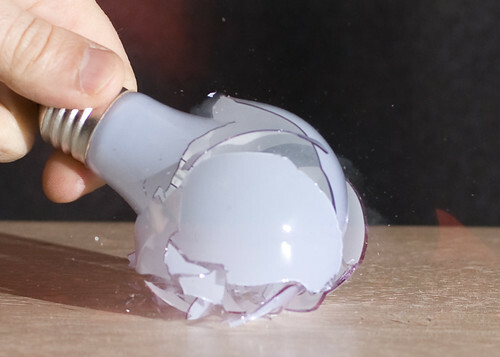 Broken Bulb, originally uploaded by PhotobyTimLimón. I have always wondered how shots (like this perfectly timed image) are taken with such accuracy. Tim Limon uses a sound trigger for his flash. When the unit hears the sound (in this case - the bulb breaking) it fires the flash. All the while his camera is taking a 3 second exposure and magically captures the shot. "These shots were taken with a 3 second exposure at f/3.5 in a dark room using a sound trigger flash built from these plans: hiviz.com/tools/triggers/triggers2.htm. The sensor was about 10 feet away from the site of impact." Watch this movie, it will make you feel great!